Cartoon features: "Out Of The Inkwell", "The Terrytoones", and "Gumby"
NYC viewing area from the late 1940's to 1960. Thanx, Bob Matthews....I heard that story many years ago from my late dad...however in his telling it was the guy on TV that I was watching at the time (prolly WPIX TV outta NYC)....or was it??? CB, that was "Uncle Don." And the story apparently is apocryphal. 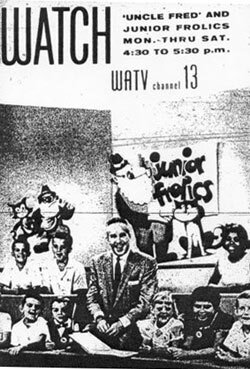 In NYC on Channel 13 they showed "Aesop's Fables" cartoons, almost all of which ended with "Farmer Gray" (aka Farmer Brown) holding a sack of money/gold/jewels (or so he thought), but when he opened it out poured hundreds of black mice that chased him off into the horizon and the farm animals laughing.